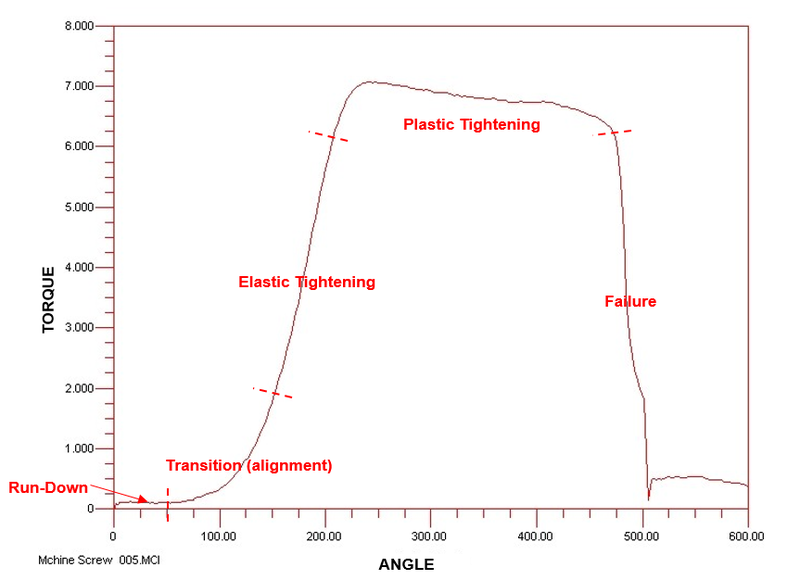 While measuring tension is often invaluable, there are cases such as non-structural joints, or those with thermoplastic joint members, where fastener elongation is negligible or not the primary measure of reliability. For these joints, and structural joints where tension measurement is impractical, torque-angle to failure is the most common method of determining installation torque and testing joint capability. The typical torque-angle trace is shown below with key segments annotated. Whether you need a torque study performed on a machine screw or a structural bolt, Peak has the equipment and the expertise to meet your needs. Need tension data as well? Take a look at our bench-top or ultrasonic torque tension testing capabilities.